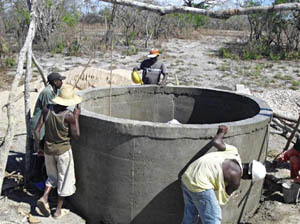 The water source of the small piped water system of Quissanga is an island reservoir with a thin layer of fresh water being surrounded by salty sea water. In order to increase the capacity of the system and at the same time reduce the risk of saltwater intrusion, a second well was constructed on Mecute Island. The construction was carried out by Agua Rural and supervised by a Fiscal (Independent Construction Supervisor) and Fontes Foundation local staff. The well is a large-diameter well (3m), about 4m deep. The first phase of the construction was completed on time, and in a second phase, horizontal filter pipes will be inserted in order to increase the capture of fresh water to a maximum. After numerous requests from other villages, Fontes Foundation decided to extend the scholarship programme until now only covering Katunguru village, to the villages of Kazinga and Kisenyi. This year, one student from each of the new villages will be selected in addition to one student in Katunguru, after they go through the transparent application process. The scholarship will provide motivated and vulnerable youth with the possibility to go to secondary school, and covers all expenses in addition to school fees. Fontes Foundation is now looking for donors to sponsor the three new students. If you are interested, please do not hesitate to contact us! Through the donation from Balder Foundation in Norway, it was possible to provide Valentine Nursery School Kikondeka, in Kanungu District, with a new classroom building. The nursery school joined the Community Based Organisation (CBO) in April 2009, and was until now teaching in a borrowed local house. 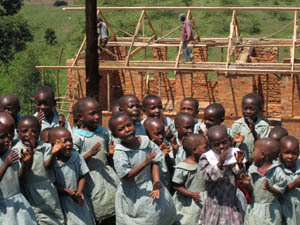 The new building will have two classrooms, an office and a store, plus a latrine. Construction is supervised and managed by the Kanungu Nurseries CBO, and parents are actively contributing with labour and providing lunch for workers.